Summer sparks endless ways to play in the Pocono Mountains. Lakes, rivers and waterparks welcome swimming and splashing while zip lines and adventure courses fuel high-flying fun for all. Races, concerts and celebrations fill the days as campfires and fireworks light up the nights. Visit our calendar of events for a full schedule of things to do in Poconos in summer! Race through the treetops on a high-speed zip line ride in the Pocono Mountains! Scenic golf courses in the #PoconoMtns! Calling all race fans! 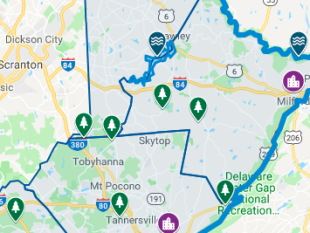 Plan your trip to the Poconos! Leisurely trips of varying distance are available with transportation provided. Your next adventure begins in the Pocono Mountains! Here are 13 thrilling things to do in the Poconos in summer. Explore beautiful Lake Wallenpaupack in a kayak from Pine Crest Marina! Pine Crest rents kayaks by the hour on a first-come, first-served basis. Check out our live cameras at area attractions and places to stay in the Pocono Mountains!